This Twice Baked Potato Casserole has all the delicious flavors of a twice baked potato, but in a quick and simple casserole form. It’s loaded with sour cream, grated cheese and bacon. . .what’s not to love? Definitely comfort food at its best. This Twice Baked Potato Casserole is going to be the perfect addition to your Easter dinner or any meal. It’s all the yumminesss of twice baked potatos, but in casserole form. It’s incredibly easy to make and is absolutely delicious. We love twice baked potatoes! 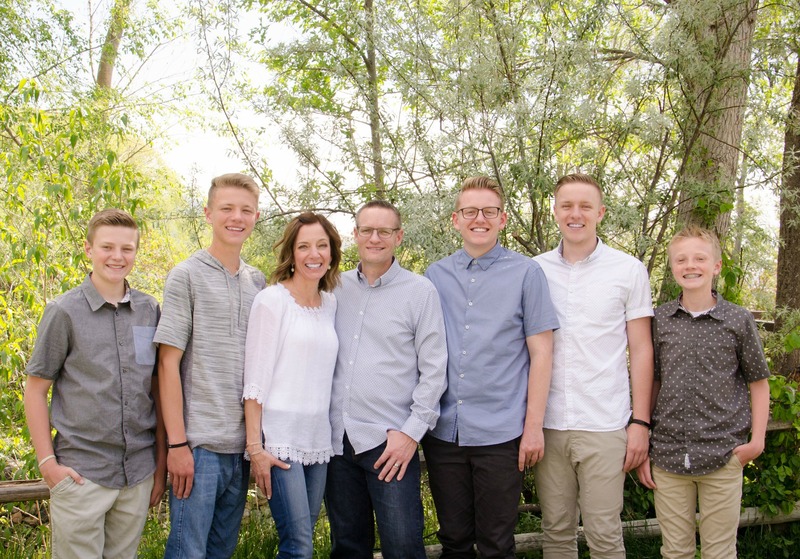 In fact, if I made them weekly, my boys would think I was the coolest mom ever. I love twice baked potatoes every bit as much as my boys do, but sometimes I’m just not in the mood for the whole scooping, mashing, filling routine. So I made a casserole version and may I just say it was a fabulous idea. My boys finished dinner and while they were doing the dishes they kept sticking their forks in the pan eating more potatoes. My husband was doing the same thing. Every time I looked over one of them was snitching a few more potatoes. Josh wasn’t home when we ate, and he was just lucky there was even any left. I can’t really blame any of us. 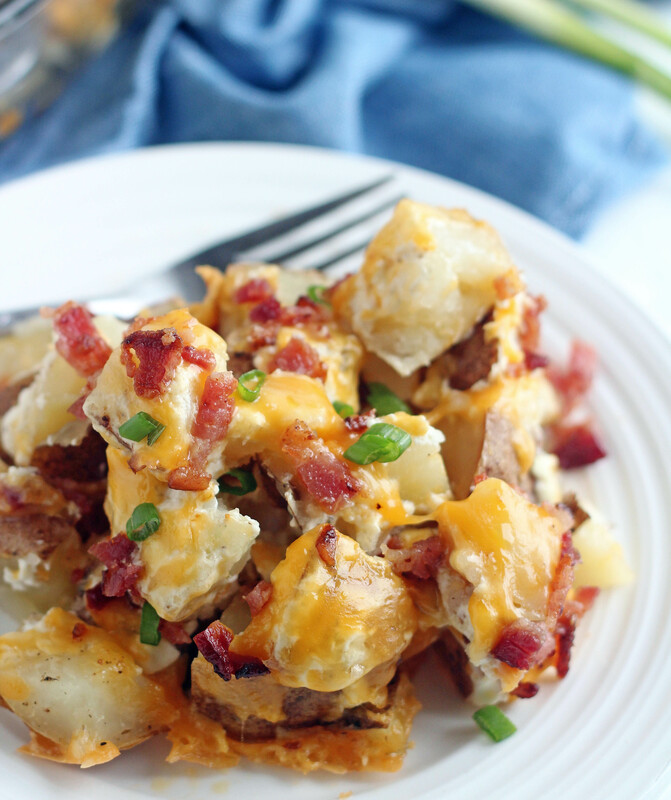 Potatoes smothered in sour cream, cheese, bacon, melted butter. . . holy moly what’s not to love? I’ve seen a lot of recipes for twice baked potato casseroles where you still have to do the whole scooping, mashing rigamarole, which is what I was trying to avoid. So I just baked my potatoes, let them cool and then cut them in to chunks! 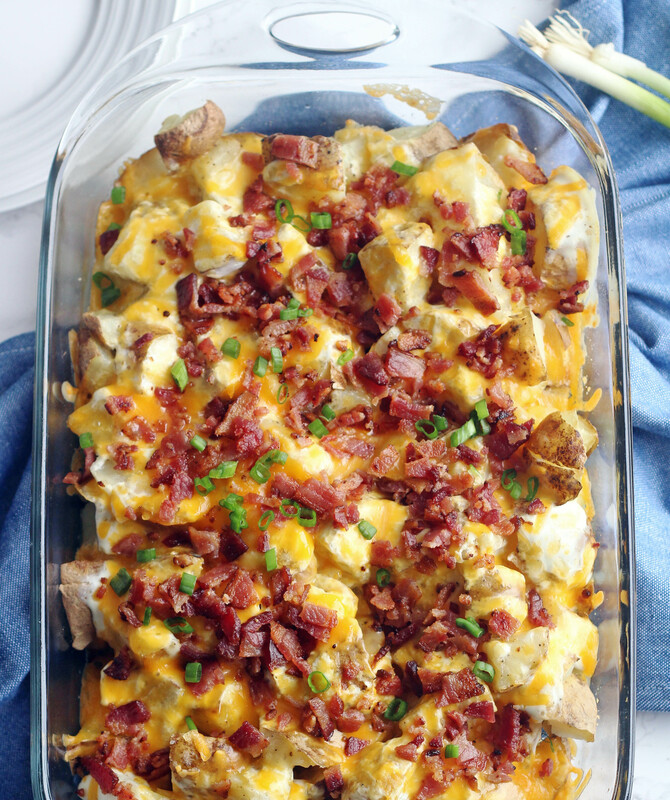 It worked perfectly and chunks of potatoes smothered in sour cream, cheese and bacon is a beautiful thing. If you’re looking for a new side dish for your Easter dinner, then you’ve come to the right place. This is really the perfect side for any meal. Cut baked potatoes into 1-in. cubes. Place in a greased 13x9 inch baking dish. Sprinkle with salt and pepper. 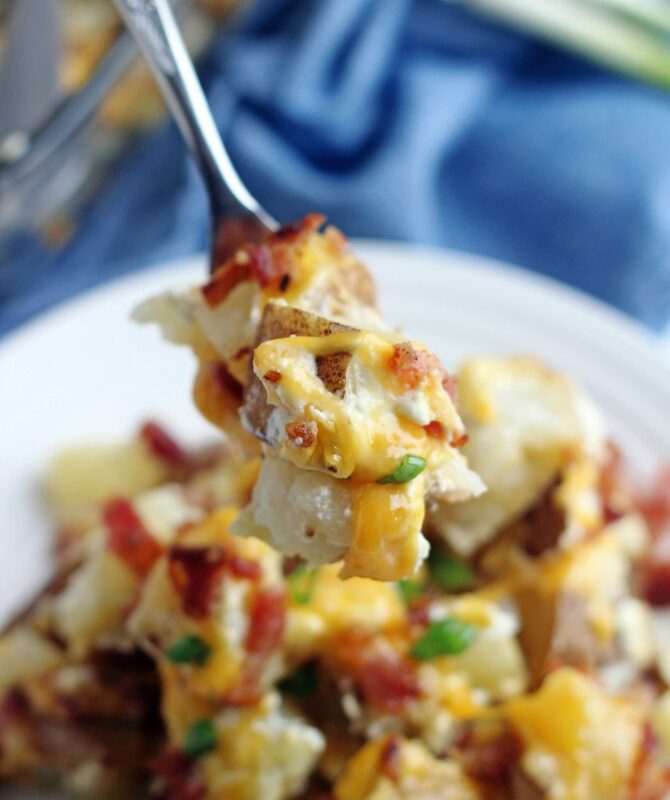 In a small bowl, whisk together the sour cream and milk and pour over potatoes. Next pour melted butter over then top with grated cheese. Cover with foil and bake for 25 minutes. Remove from oven and take off foil and sprinkle with crumbled bacon. Put back in the oven for 5 minutes. Garnish with chopped green onions, if desired. Jodi, this is so genius. I love this recipe. We are making mashed potatoes for Easter, but this will definitely have to be made next Sunday dinner. I love how you don’t have to peel the potatoes either (at least from the pictures it looks like the skins are on). And the cubes are a great idea. The photo is just beautiful and I am sure it’s delicious. Thank you for this! Hey Teresa! You’re right, you don’t peel the potatoes for this, which makes it even easier! These potatoes are crazy delicious. Thanks so much for the comment, I always love hearing from you. Let me know if you make them. Have a great holiday weekend. Hi Jodi. My husband and I made these potatoes the other night. They were so yummy! Thanks for this simple and delicious recipe. My husband called them “Naughty Potatoes.” My 13-year-old son wanted to know why he called them that. We mentioned the ingredients sour cream, butter, cheese, and bacon. It was decided that maybe we should call them “Naughty, Naughty Potatoes.” Regardless of what you want to call them, we decided that they are worth the indulgence. Hi Becky! Your comment just made me laugh out loud. That is a great name for them! So happy to hear you loved them. Thanks for leaving a comment.